and there are all kinds of weapons that the soldiers use. They are for destroying satans and devils. 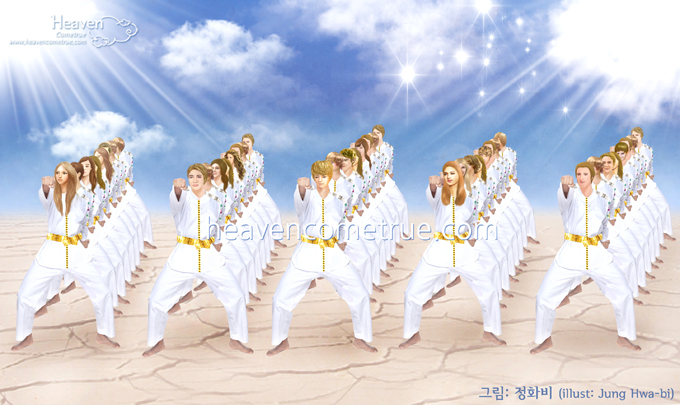 The heavenly troops are necessary for Heaven. and saving lives on earth. the heavenly troops go and fight against satans’ armies. When they fight, the heavenly army always wins. The heavenly troops went to a training ground. In contrast to the disorder of the satans in hell, they moved in line and in perfect order. their hands and feet with purpose. They wore white uniforms and their shoulders were decorated with shining diamonds. The troops who were dressed in splendid uniform looked so beautiful and handsome. I was open-mouthed in awe looking upon this sight. Every time the heavenly troops moved, they shined in a different way. I said to the Holy Son “Lord! They shine with every movement. It’s wonderful. “Satans hate light. They like dark places. The moment they lay eyes upon the bright light of heaven, they die. and I have personally trained and are absolutely necessary.